Our adult parties and team building events are great for moms’ groups, sororities, book clubs, corporate offices, sports teams, reunions, bridal/baby showers, and more! 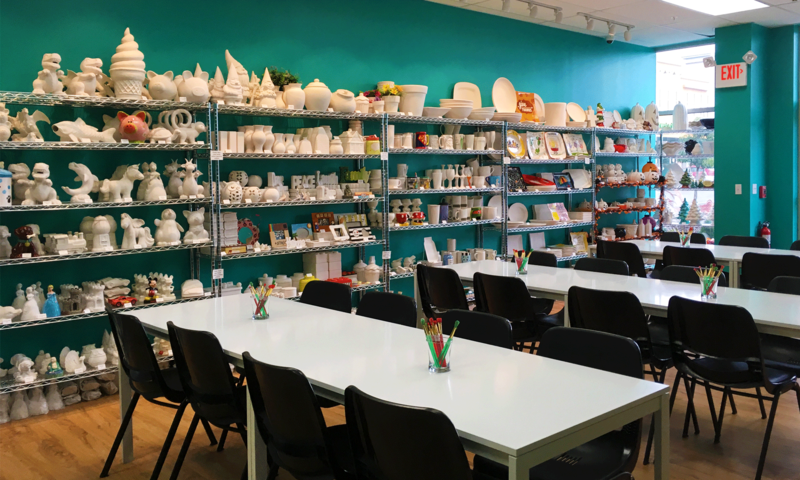 Arts & Glass is a great creative place to host your next group meeting or party. You are welcome to bring your own snacks and non-alcoholic beverages and spend a creative evening with us. We can develop a theme for you or you can work a la carte, letting each person pick his or her own project. Friendly staff will be on hand to help your group through the creative process. Reservations can be made for 2-hour blocks for $55 with a $150 minimum merchandise purchase. Weekend time slots available are 10-12, 12:30-2:30, 3-5, and any time after 5:30pm. For weekday availability, call the studio to schedule. Book online here! Everyone fills out a short questionnaire on an index card with his or her name and places them in a hat. Each person then draws a card from the hat. Based on the questionnaire, that person paints a pottery piece or creates a glass dish for the colleague on the card. Once all pieces are finished, the group takes turns trying to guess for whom each piece was made! Makes a great holiday party too!